All juices are not created equal. Why does JuiceFresh taste better, stay fresher longer and make me feel some much better than other juices? It's simple. JuiceFresh is Optimized To Freshness™. Our exclusive 4-Step JuiceFresh Crush™ makes all the difference. Your JuiceFresh is never treated. Your juice is never subjected to the heat of pasteurization. Your juice is never subjected to 37,000 pounds per square inch of High Pressure Pascalization (HPP). If you see a juice that says "Cold Pressured", that's just a fancy way to say it has been treated by HPP so that it has an extended shelf life. At JuiceFresh we never HPP our juice. We never add sugar. We never add water. The only ingredient in your juice is fresh fruits and vegetables. 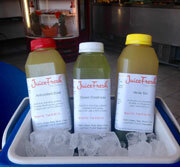 JuiceFresh offers four amazingly great tasting cold press green juices, plus one non-green awesome juice treat Orange Crush. * If you are taking a blood thinner remember that kale, collards, spinach and certain leafy greens are a natural source of Vitamin K1 (also known as phytonadione, phylloquinone or phytomenadione) which strengthens your blood and may counteract your blood thinner so talk to your Doctor about Vitamin K1 if you're on a blood thinner. We all need Vitamin K1 for bone protein and to avoid Osteoporosis. Prolonged use of antibiotics can disrupt Vitamin K synthesis. If you are having problems with bleeding and bruises, remember that Vitamin K may help. Verde Sol - spinach, cucumber, Granny Smith Apples, oranges and lemon. ** Traditionally referred to as "cruciferous" for the cross-like shape of the four equal sized petals in a flower, or by the Latin name Brassicaceae (translation: cabbage), Verde Sol is a specially designed juice for customers who may have thyroid issues. If your diet requirements call for reduced intake of kale or other brassica vegetables, Verde Sol is the juice for you. (3-Day Juice Cleanse includes 3 qty. 16 oz. Island Breeze). Island Breeze is what we call an introductory juice. It is sweetened with a dash of pineapple juice to make it super tasty even for the individual who may have never experience green juice. We also refer to it as a dessert juice because Island Breeze is great for satisfying cravings for late night sweets or if a green juice is too strong for you first thing in the morning. Technically, Island Breeze still qualifies as a "green" juice because it includes kale and bok choy. Orange Crush is not a green juice. 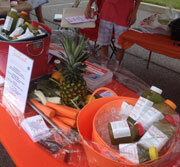 It's awesome tasting and you will love it, but "OC" is not included in the 3-Day JuiceFresh Cleanse. "OC" does not include any chlorophyll and what it may lack in detoxifying power of chlorophyll, it makes up for in awesome taste. If you're looking for a way to get your family off soda, this may be the ticket. Just wait until you taste Orange Crush for yourself. Terra Vida is a deep, rich, powerful, red beet juice that has sweet earthy tones. Beet juice is strength in a bottle and this blend may be the best juice you have ever tasted. Read about the heart health and healing benefits of Terra Vida and you'll be a "beetliever" too! 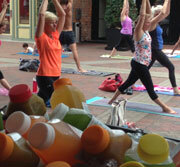 Terra Vida is not part of our standard "green" 3-day juice cleanse but we can substitute. Just ask! What is it and where do I get some? Have you heard horror stories about The Triangle of Treatment? That's where all the resources are focused on treating the symptoms of disease rather than their cause. Learn how Functional Medicine is being used to break the corporate cartel of big government, big pharma and big food and be reminded that medicine is thy food and food is thy medicine. Looking for the best way to ease back into a healthy diet following your cleanse? We'll show you easy and practical ways to take full advantage of your cleanse while carefully transitioning back to super foods that will power your body, mind and spirit. Inflammation is big trouble and making product claims about inflammation reduction can cause big trouble for companies in the health and wellness category. Whether you are talking about supplements or the live enzymes in a raw alkaline juice, what is okay to say about inflammation and how crucial is it to your health to stop inflammation in its tracks? A businessman from Australia by the name of Joe Cross has likely done more than any other single person to bring the reality of the power of juicing to the public. Watch this extended trailer for Joe’s documentary (available on Netflix) which is titled Fat, Sick & Nearly Dead.